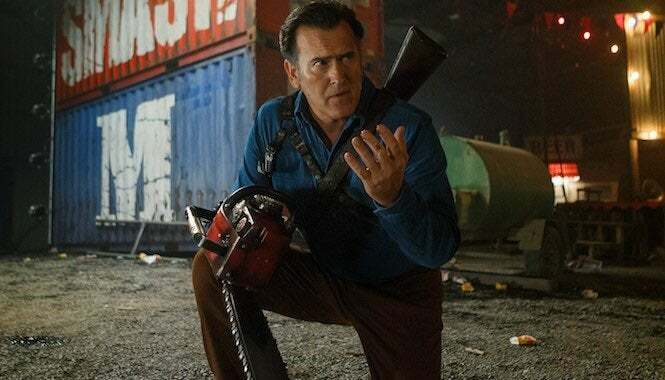 We’re just a few days away from the return of Bruce Campbell as Ash in the third season of Ash vs. Evil Dead on Starz, which promises to be the bloodiest – and probably most fun – yet. But in the meantime, Lionsgate has announced an interesting way to promote the forthcoming series – through one of the Overwatch League’s most popular teams. As part of the promotion, fans will have access to special events surrounding Ash vs. Evil Dead, including exclusive screenings of episodes, as well as meet and greets and Q & A’s with creative voices behind the franchise. No word on when these will begin. The jerseys will make their debut this Saturday, when the LA Valiant faces off against the Shanghai Dragons around 5 PM PDT. You can catch the action on the Overwatch League channel here. Ash vs. Evil Dead’s third season premieres on February 25 on Starz. Overwatch is available now for Xbox One, PlayStation 4 and PC.